The accommodation suits 4 adults only. No pets allowed. A comfortable and tastefully decorated cosy self contained unit that is fully appointed. The unit is open plan with the lounge room as the central focus and the two bed rooms, bathroom and kitchen coming of it. The master bedroom has a Queen size bed while the other bedroom has two single beds. All beds have electric blankets in case the nights get chilly. Built-in wardrobes are in both bedrooms. The bathroom comprises of a Shower, vanity sink and a trough. The bath room is also provided with separate heating. The toilet comes off the bath room. The kitchen is fully appointed with cooking appliances such as a microwave and upright stove, cooking utensils, cutlery and crockery. Outside under the carport is an Electric Kettle BBQ. 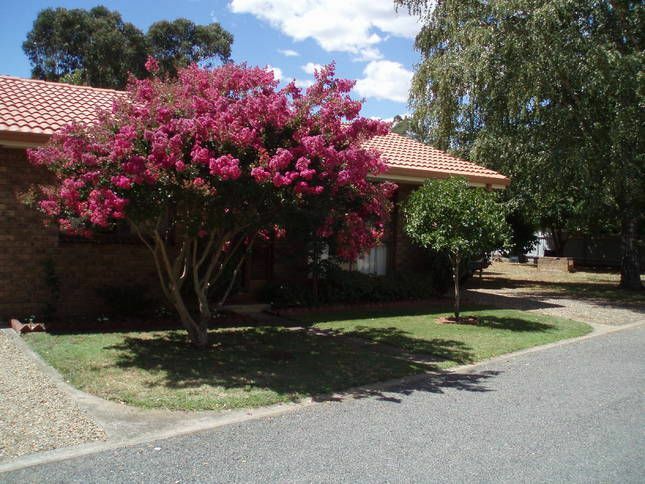 A separate laundry,carport and a large backyard with mature shady trees makes for a pleasant stay all year round. Very comfortable and well located place to stay. Warm, comfortable with everything you need. Some of the decor and amenities are dated, but everything is excellent condition and perfectly functional. Very comfortable bed. Great setup for mountain bikes, secure storage and cleaning. We stayed a few nights and we loved it. Short walk to the shops and restaurants. Highly recommend it to stay here. Neat cottage in good location. We didn’t need anything that wasn’t here. It’s neat and clean and in a good location to walk wherever you want. While the kitchen is older everything works well. Clean, neat and exactly what we wanted. We spent 2 nights at this lovely little town house. It was spotlessly clean had everything we needed. Location very close to the centre of town so we could ride out bikes everywhere. Great value for money. Thank you for review. So glad you enjoyed your stay. We loved our stay in your villa. It had everything we needed, no issues at all. Well priced and would definitely stay again. Thank you for your review. We are glad you enjoyed your stay with us and are happy that you would like to come again.